The Perini Navi Group has launched sailing superyacht Seahawk, the first yacht in its new 60m series. Perini received orders for two 60m yachts in 2011; the first hull, C.2193, is a ketch and the next, C.2218, is sloop rigged. 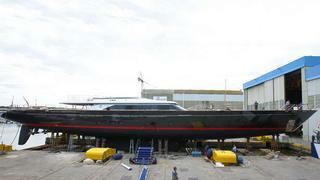 Following the launch at the Italian builder's yard in Viareggio, stepping of Seahawk's two masts was completed. The ketch-rigged sailing yacht has a 62m and a 52m mast in aluminium while the booms and spreaders are in carbon fibre. The foils and standing rigging are also carbon fibre, a first for Perini Navi. She has a total sail area of 2,125 sqm. Perini Navi's Mast Division has created a new breed of furlers, fully recessed on the foredeck, to furl in the head sails. The Mast Division also developed the new captive winches found on board, which are designed to increase the maneuvering capabilities at high speeds. Designed by Perini Navi in-house naval architects along with New Zealand designer Ron Holland, Seahawk represents a new generation of Perini Navi sailing yachts marked by sleek lines and the use of performance-enhancing technologies. Christian Liaigre designed the elegantly contemporary interiors. The all-aluminium yacht has a gross tonnage of less than 500 GRT and a displacement of 570 tons. The second 60m hull, featuring a 75m carbon-fibre mast, is scheduled for a 2014 delivery, while the third unit, the ketch C.2232, will be delivered in 2015.